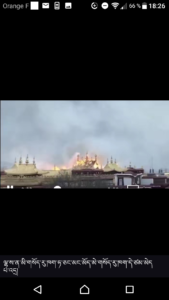 Social media image of the fire at the Jokhang Temple in Lhasa which broke out on February 17, 2018. 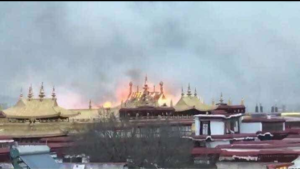 The guest post looks closely at the fire that broke out in Lhasa’s Jokhang Temple on February 17, 2018, and analyses the official response. The post draws heavily from social media from that day, both from Tibetans in Tibet and in exile. Thank you to Françoise Robin and Robbie Barnett for this comprehensive and significant essay. 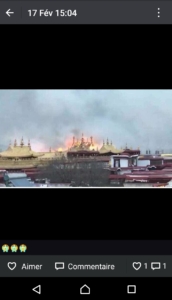 On Saturday, February 17, 2018, the second day of the Tibetan new year, a fire broke out in the Jokhang. This brief statement may not carry great significance beyond the Tibetan or the Buddhist world, but it points to a potential tragedy for Tibetans and for Buddhists from Mongolia, Bhutan, Ladakh, Zanskar or other areas of High Asia where Tantric or Vajrayana Buddhism prevails. Contemporary replica of the traditional representation of the supine demoness, nailed to the ground by temples built on her joints, with the Jokhang in the middle of her chest, as shown by the arrow (Kyichu Hotel, Lhasa, F. Robin, 2009). 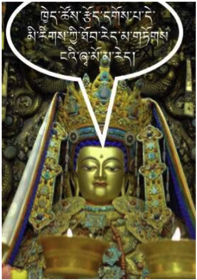 The word “Jokhang” (ཇོ་ཁང་།) is, if we use it correctly, the name of the most revered of the many chapels that are found within the vast temple complex known in Tibetan as the Tsuklakhang (གཙུག་ལག་ཁང་།). Located in the historical and religious heart of Lhasa, and therefore of Tibet, the Tsuglakhang was founded in the 7th century. It is an ensemble of chapels teeming with statues and woodwork – some of it dating back to the time of the foundation of the temple – with courtyards, assembly halls, and enclaves crowded among its four storeys. The Jokhang, which is the symbolic heart of this complex, is the sanctum sanctorum of that vast ensemble. The classic histories of Tibet say that it was built at the time of the first Emperor of Tibet, Songtsen Gambo (died 649/650), exactly above what was said to be the heart of a supine demoness or ogress (སྲིན་མོ།), to nail it to the ground. Tradition has it that many other temples were built at the same period, apparently to assert the authority of Buddhism over the beliefs that then prevailed in Tibet. The late and much missed conservationist André Alexander dedicated a large part of his short life to the preservation of Tibetan architectural heritage, despite the unimaginable difficulties posed by the Chinese authorities regarding his efforts to protect the old town of Lhasa and its temples. In one of his writings about the Jokhang, he concluded: “The Tibetans have since long associated the Jokhang with the genesis of their cultural and religious civilization. But its importance goes even beyond that, touching the cultural histories of India, China and beyond. 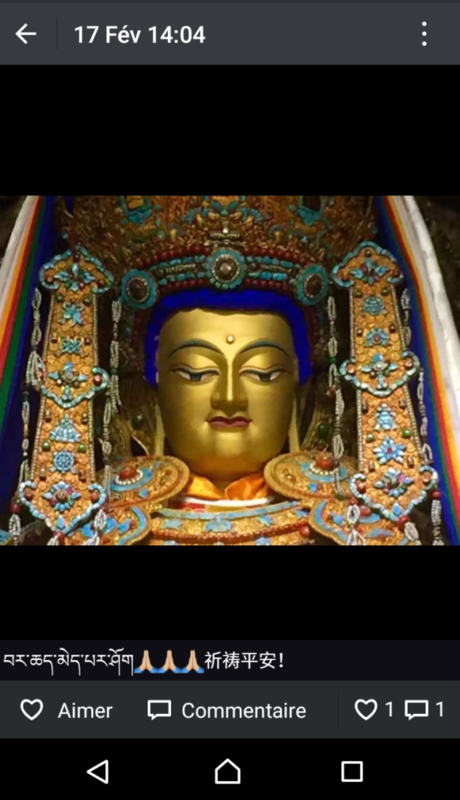 As miraculously-preserved physical testimony to the history of Buddhism, the significance of the Lhasa Jokhang cannot be overstated”. Picture of the Tsuglakhang, taken from the south. 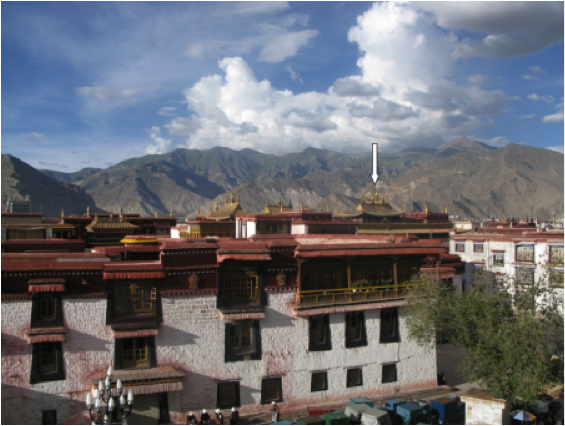 The actual Jokhang – the chapel housing the Jowo – is behind the roof indicated by the arrow. In the background at the far left of the photograph is the 13-storey block that is the seat of the Lhasa Public Security Bureau. Traditionally, out of respect for the Jowo and the Jokhang, no building in Lhasa besides the Potala Palace could rise above the Jokhang (photo: F. Robin, 2007). But as often happens when a serious event occurs in Tibet, tragedy was followed by silence from the state: apart from two brief statements by the Chinese media, four days apart, assuring the world that no “cultural relics” had been damaged in the fire, there has been no word from the government or its journalists. For decades, foreign journalists have not been allowed to go to central or western Tibet (“the Tibet Autonomous Region”) without official permission, so that very little independent news trickles out even at the best of times . And indeed, since the fire broke out in the Jokhang, no foreign journalist has been allowed to go to Lhasa to conduct enquiries. More worrying is the silence of the UNESCO: the Jokhang has been listed with UNESCO as a World Heritage site since 2000, but, when thirty researchers in Tibetan studies and art history wrote to the director of World Heritage Center, Dr. Mechtild Rössler, asking for the organisation to intervene urgently, the reply was that their team “is following this matter closely with the ICOMOS [International Council on Monuments and Sites] experts concerned.” No other assurance or information was offered. As of March 9 2018, there was still no information on the UNESCO website about the fire, as if it had never happened, and no reason had been given for keeping silent. The Tibetan government in exile, based in Dharamsala in India, did not do particularly well either: initially, it relayed placatory information spread by anonymous sources on Chinese social media – almost certainly deliberate disinformation – claiming first that the entire Jokhang temple complex (the Tsuglakhang) had not caught fire, and later admitting that it had been damaged, but that the Jokhang chapel had been spared. Neither of these claims was correct. Dharamsala was then silent for a few days and only on March 5, fifteen days after the fire, reported that its Prime Minister in exile, Lobsang Sangay, had finally appealed to UNESCO, asking it to send a mission to investigate the fire. 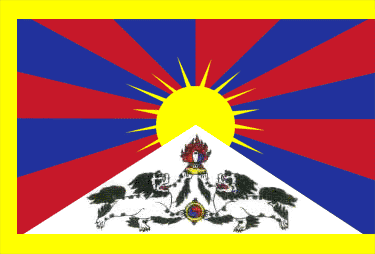 Puntsok Tsering, a Tibetan intellectual who runs the Tibet Haus in Frankfurt, has written what is one of the best articles on the fire to be found in the exile Tibetan media so far. He suggests that the delayed reaction of the exile government and the silence of the exile community reflects the fact that the Jokhang and the Jowo have taken on an almost virtual reality for Tibetans born in exile who have never set foot in Tibet, despite the importance of these names for all Tibetans. The sacred chapel and its statue have thus become for them virtual rather than real, and this could account for the absence of strong responses from the Tibetan diaspora. For Puntsok Tsering, this indifference is as great a catastrophe as the fire itself, indicating as it does the gulf between perceptions among inside and outside Tibetans that had not become apparent till now. Since UNESCO and the exile government have not emerged as reliable sources of information, no doubt due as much to denial of access as to lack of interest or concern, and since foreign news outlets are not allowed to go there, overseas Tibetans who have lived and grown up in Tibet and so have connections there could be expected to glean some information from inside. Unfortunately, much to their dismay, this has not been the case, because they cannot speak by phone or via social media to their family without putting them at risk. Even as early as the evening of February 18, a friend from Lhasa who lives in Paris and who has close connections to people at the Jokhang, told me: “I dare not ask for news”. Since then, that friend has only been able to learn that the monks at the Jokhang were confined to the temple on the Sunday after the fire, usually a day on which they visit their families. My friend deduced from this that Jokhang monks were prevented from going out in case they reveal to their relatives the extent of the damage. The most severe situation is, of course, that of Tibetans in Tibet, who have been left in the dark regarding what happened to their most sacred temple. 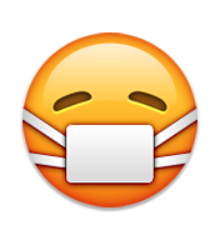 As soon as the news about the fire was known – official media say it began at 6.40pm on February 17 – Tibetans used Chinese social media (mostly WeChat, a heavily-watched Chinese equivalent to WhatsApp) for a few hours to express anguish, sorrow and concern in response to a number of short videos that circulated between private users. These showed flames consuming the roof of the Jokhang chapel, or, later, plumes of white smoke coming from somewhere in the temple complex that seemed to correspond to the Jokhang chapel. In the background, one could hear people crying out and weeping at what is for Tibetans an unimagined nightmare. 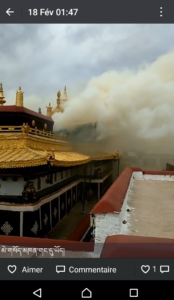 Another WeChat message from Tibet called for prayers: it was posted on February 18 with the words, “When damage caused by fire, water and so forth occurs, this prayer should be repeated many times”. 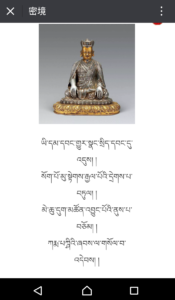 This is from a prayer addressed to the 13th century Lama Karma Pakshi (ཀརྨ་པཀྵི། 1204-1283), and the message ends with the plea: “To he who vanquishes the power of fire, water, poison, weapons and demons, I address my prayers to the feet of Karma Pakshi”. Among my friends, only one, ignoring the injunctions of silence, dared to circulate a short video with the caption: “Where are the firemen?”. Tibetans abroad were free to offer more acerbic comments. “There are many platoons to kill people in Lhasa, but there don’t seem to be that many to put out a fire,” said one. The author of this message was playing on the similarity between the Tibetan words for “people” (mi མི།) and “fire” (me མེ།) in Tibetan, and makes use of the fact that in Tibetan the words “to extinguish a fire” mean literally “to kill a fire”. So far I have only found one article from within Tibet or China that is openly critical of the way the fire was dealt with by the Chinese media. It was written by a blogger who, under the pen-name Mila Tsitsi (མི་ལ་ཙི་ཙི།), has become quite well known among social media authors and commentators in Tibet. His article offers a precisely documented account of the news released about the fire by the Chinese press, such as the Lhasa Evening News, the Xinhua news agency, and others. 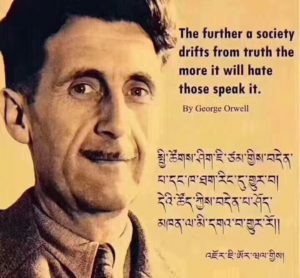 Identifying seven stages in the disclosing of the news, Mila Tsitsi notes, in a long article on the Tibetan web-forum Chome that has since been removed, the contradictions and the silences that can be found in the official news releases. “When we, black-headed Tibetans, are submerged by suffering and hardship, here in this world, we return to this home, our pockets filled with tears. In this home, we have found the strength to face competition in this world. In this home, we find extraordinary perspectives, such as those about the value of the human body, perspectives on life and death, and the phenomenon of existence. In this home, we find the essence of this smiling face, in the midst of the tempest which rages on the high plateau”.. He ends on what is perhaps a somewhat forced note of optimism by mentioning the benefits that Tibetans can recoup from this catastrophe: since they all joined together with the same fervor when they heard the news, with the same sadness and the same prayers, perhaps, he suggests, they can therefore find a new strength together. Another essay, written on February 18 and circulated widely, dealt with the history of the crown that is placed on the head of the Jowo, a topic that has been hotly debated in Tibet, creating a protracted controversy in the community. This article has since disappeared from WeChat as well,  though not without causing some annoyance abroad: one Tibetan in France has posted the following picture which says: “What you should discuss is not my hat, it is the rights of nationalities”. Whatever may be the case, over a month after the fire, almost no information has filtered out: the temple was reopened briefly to pilgrims after a few days, but not the part that includes the chapel itself or the upper sections. One official picture was published showing the Jowo, and a few others were circulated on social media, but experts who have studied them have pointed out new features or incongruous items in the picture, suggesting that much has been hidden.